CRM systems are great until you have to use them while you’re out on the road, in the car, or traveling from meeting to meeting all day long. It can be difficult to stay on top of updating customer profiles, email or calling contacts, and making notes of any conversations you have in meetings or phone calls. So, to all our road warriors out there, we have a helpful tool for you to use from the convenience of your own phone in the comfort of your own car. Just don’t email and drive! We know that mobile sales teams often struggle trying to log and track contacts, meetings, emails, and calls while out in the field. It is usually difficult to do this on a phone or tablet and so the sales person either has to go back and update contact records later at a computer or doesn’t do it at all. This creates a disconnect since all contact interactions aren’t being logged. If another team member then tries to see where a lead is at or what the last interaction was with a contact, they don’t have the most up to date information. However, the HubSpot app has all the options a mobile salesperson needs to contact leads and customers, log calls, set tasks, and use all the other functions they would need while still tracking all information in the contact’s record. 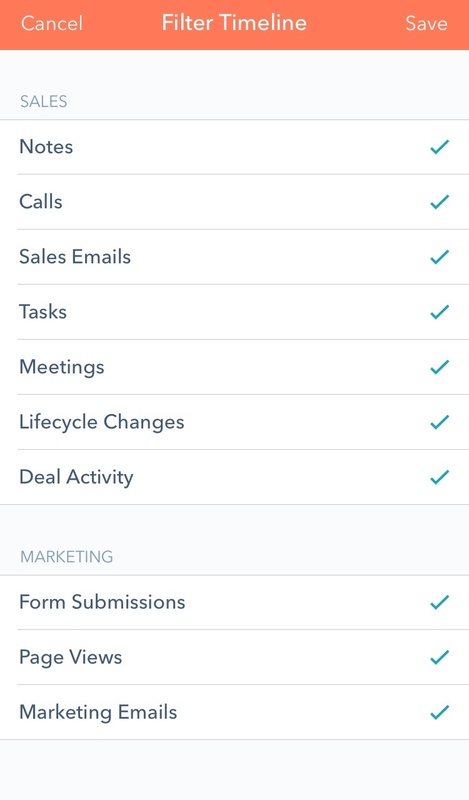 As you can see from my own contact record in the photo below, any contact entered into the HubSpot CRM can be accessed in the app. Just like in the computer version, you can see all the actions a contact has taken. In my contact record, you can see that I opened emails and filled out a form in the CRM. You can view any deals I am associated with as well as all of my contact properties. This is useful so you can track if a lead has opened an email or taken another action from the comfort of your car without needing access to a computer. You can also call, text, or email each contact right from their contact record in the app. 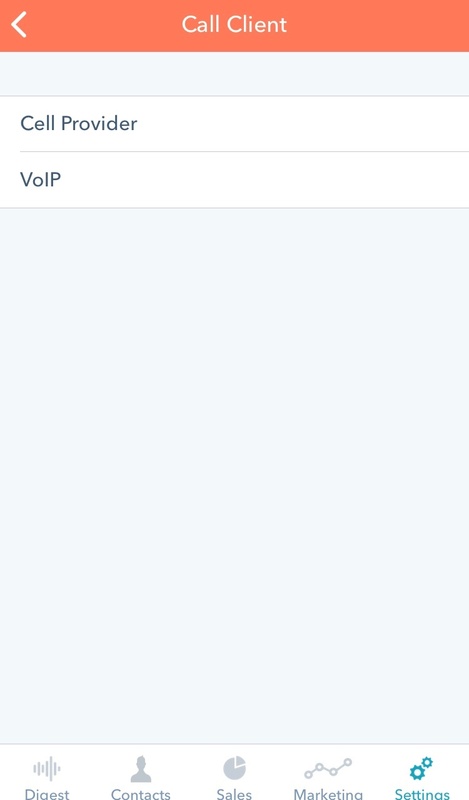 You can also choose what you’d like to see for your contact’s timelines. If it’s not necessary for you to see lifecycle changes or page views, you can exclude those from your timelines so you only get the necessary information on the road. One of the biggest complaints about most CRM systems is that it is difficult to use the tracked email function on the road. Most email clients integrate with HubSpot, but the phone apps for these email clients do not track and log emails into the CRM system. It is frustrating to log onto a mobile website to try to log and track emails on the road. One of the most beneficial parts of this app is the ability to send tracked emails to contacts. By pressing the envelope button under their name in their contact record, a tracked email will pop up. You can type your own email and send it to your contact, or you can use a pre-developed email template. 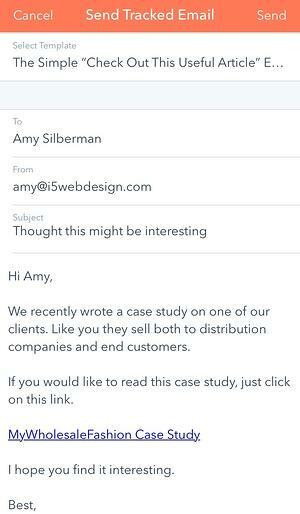 Email templates are a huge timesaver for team members who work in the field. For example, if you have a follow-up email you send to every lead after a meeting, you can plug this into a template. When you get back into your car, you can pull up the lead’s contact record, choose the “After First Meeting” template, and plug in any specific information needed. This can all be done in about 30 seconds and the email will be tracked and recorded in the contact’s record for future knowledge. 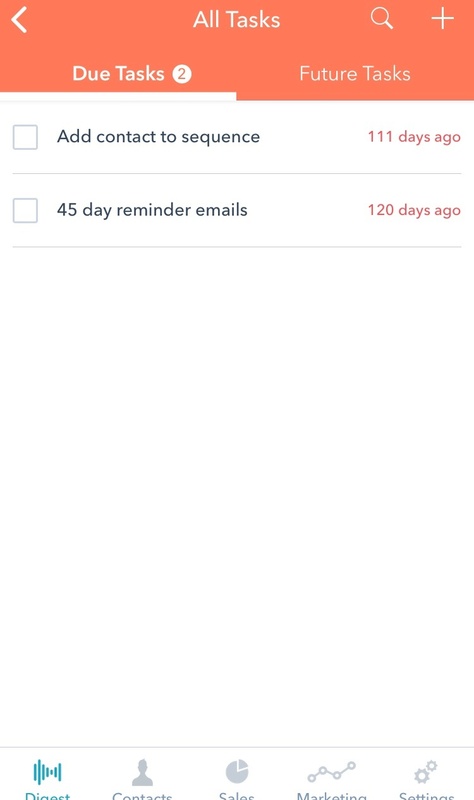 Any other common emails you send to contacts or leads can also be put into a template so you have easy access to these in both the phone app and the computer platform to use at any time. 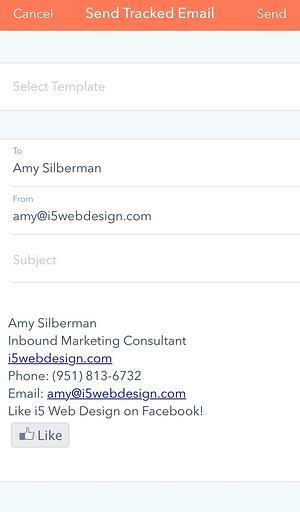 Below is an example of a template we use plugged into the email option in the app. It pops up right away so you don't have to waste time typing an email or copy and pasting it from your email client. Change any specific details you need, press send, and you're good to go! Another great feature of this app is you can also call clients directly from the app. This can be done through your mobile plan or by using VoIP and the minutes you get through the HubSpot Sales plan. 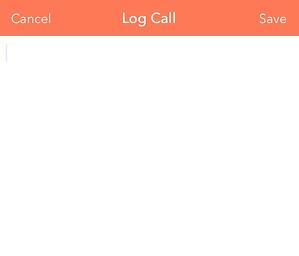 After the phone call, you will see an option to log the call. 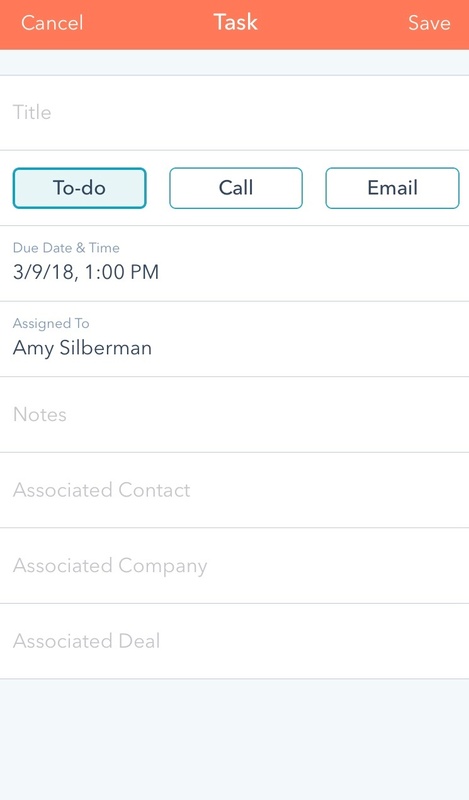 If you don’t record the call through HubSpot (or even if you do), you can log notes to remind you of the details of your call. If you have HubSpot Sales, deals are an important part of a contact record. Each contact will have any deals they are associated with linked in their contact record. This way, you can easily access their specific deals and see if there is any new information in that deal. 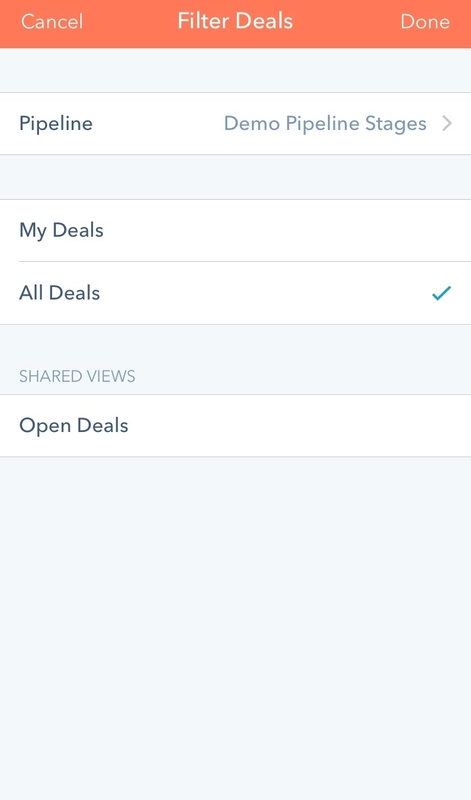 You can also access all your deals and deal pipelines through the Sales tab in the app. 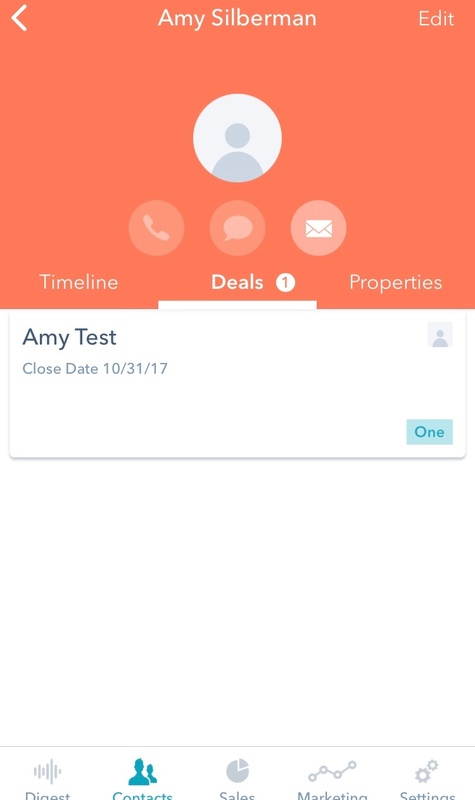 As you can see from our test deals entered below, you will be able to see every deal and what stage each deal is at instead of having to look at a specific contact to see their deals. Finally, you are able to filter your deals by 'all deals' or by 'your deals'. Deals you’ve specifically made or are tied to you might be the only deals you are interested in, so you can set up your app to only see these deals. 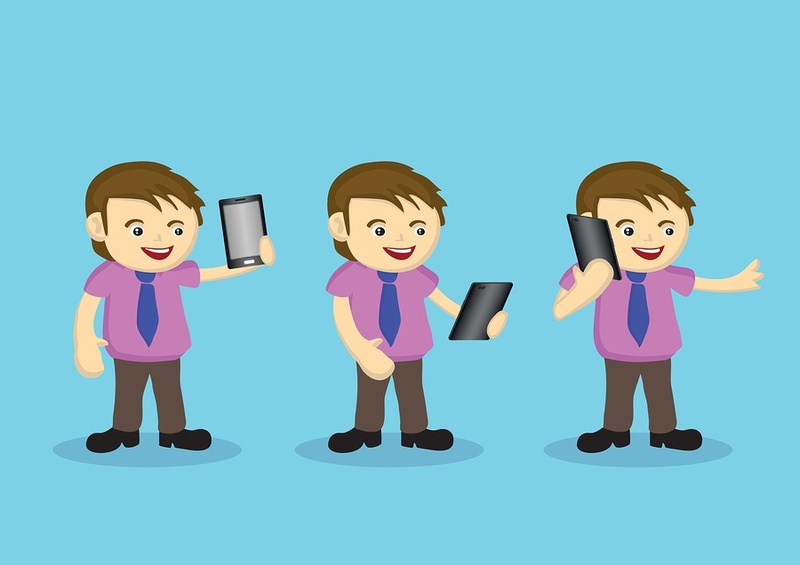 Other helpful tasks for mobile sales teams include setting and completing tasks within the app. If you use tasks to keep yourself organized (which I highly recommend especially for people like me who work well based on a list) then it might be frustrating not having access to your list of tasks throughout the day. 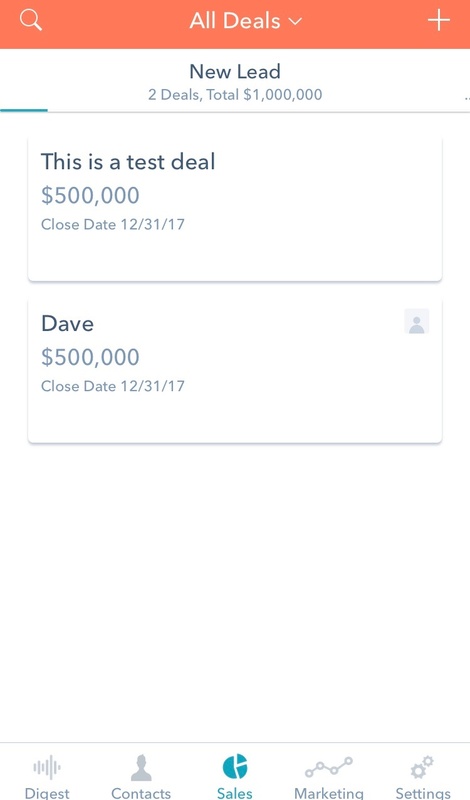 As you can see from my purposely uncompleted test tasks below, the Hubspot app allows you to check your task list, mark completed tasks, notify you about uncompleted tasks, and even create new tasks. This is helpful not only to keep you on track, but also for creating tasks for other team members, such as in-office admin staff, throughout the day. To create a new task, you simply enter the task, choose which kind of task it is, choose the due date and time, and assign the task to either yourself or a member of your team. This task will then appear in the correct person’s list just like if you made the task on your computer portal. Finally, you can view many other areas in your portal depending on the type of HubSpot products you use. There are options for marketing engagement tracking, contact activity feeds, landing page and blog post performance and more. Simply choose which areas are important to you to view and they will appear on your app homepage much like a dashboard in the computer portal. Functionality and ease of use is a huge factor when trying to find a CRM program for any company. If you have a mobile sales team, you have to provide them with the ability to actually use the tools you implement in your company. 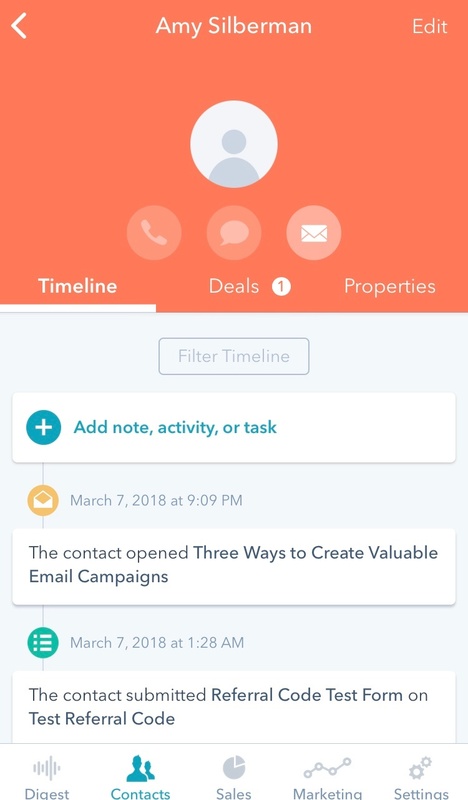 The HubSpot app provides your team with the ability to contact, track, and, log any information they receive from contacts directly from their phones while they’re in their cars. There’s no need for them to get back to a computer to upload the day’s information and the contact record can be updated in real time. This app is a great tool for any mobile salesperson. But don’t just take my word for it! Try it out and see what you think. We’re here if you have any questions! Are you interested in learning if the HubSpot CRM system will be a good fit for your business? Contacts us today for a free consultation to learn more!